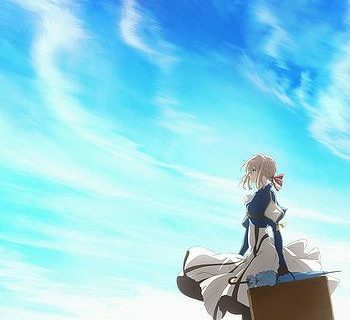 A very emotional episode in this week’s Violet Evergarden, with Violet playing one more time the role of a healing trigger in people’s memories rather than her own. Violet is invited to ghostwrite for a famous playwright. At this point, her transcription skills seem to have been entirely replaced by her typing skills, since in this episode, as well as in the previous one, she seems to be writing exactly what she’s been told. Violet travels to visit the writer and perform her duties. He lives in the countryside and is somewhat of an alcoholic, living in a beautiful two-story cottage that is a complete dump. Violet shows up, stops his drinking, cleans his house, buys him paper, cooks for him, writes his play, jumps in a lake for his inspiration’s sake, and somehow between being a docile servant to all his whims, she helps him overcome the early death of his only daughter. He gives her a fancy umbrella as a gift for all her trouble and sends her off. On her way back, Violet finds out the Major is dead, and she is not impressed. 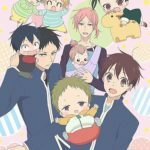 Cleaning: A common theme in anime and manga (especially in Hayao Miyazaki’s work) is having the character who moves into a new space (especially if that character is a girl) to clean that new place and make it their own. See Howl’s Moving Castle and Spirited Away. In our case, Violet also took away the booze. The writer’s reaction to that much sass was rather unrealistic. Have you ever met an alcoholic, bruh? Carbonara: A traditional Italian pasta dish from Rome including egg, cheese and pancetta, and craploads of black pepper. On many occasions, it is mistakenly cooked with cream instead of egg. If you are one of these people, you really need to sort out your priorities. PS: thank god Violet cannot cook because that would have been one step too far for my patience to handle. 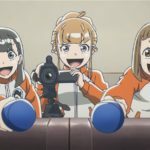 10 years of therapy in 10 minutes: It is probably not the first time you see this in mainstream media, especially in anime. Problematic characters that realistically suffer from traumatizing experiences and various mental illnesses like depression for years are magically having their lives changed after a brief encounter with the gifted protagonist. Spoiler alert: in real life, this doesn’t happen. Supercalifragilisticexpialidocious: You know who else flies around holding an umbrella? That’s damn right, Mary Poppins! I found the writer’s backstory involving his daughter to be very touching, but then again, I can’t bear watching stories about the untimely death of children. I enjoyed this episode for a few reasons: first of all, for the first time, the writer saw and characterized Violet as a child, which was refreshing to me, because the way her character carries itself is ridiculously adult. Seeing her break down and cry was also a relief, made her look more human. Also, the scene of her jumping over the water was majestical indeed, even though I’d prefer to watch it at regular speed and have a good laugh. Maybe, in the next episode, Violet will go berserk and run off to find the Major (who, by the way, I believe is alive). HELL YEAH! 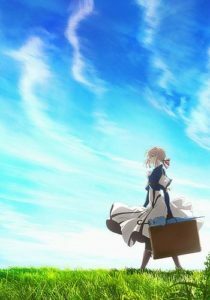 What did you think of Violet Evergarden’s Episode 7? Did it live up to your expectations? Let us know in the comment section below! 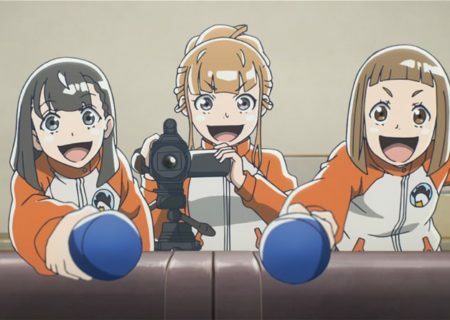 And don’t forget to check the rest of the Winter 2018 anime reviews on MANGA.TOKYO!